Today we’ll be comparing the rough drafts of Zero’s Rockman X5 ending scenes with how they appeared in the final game. 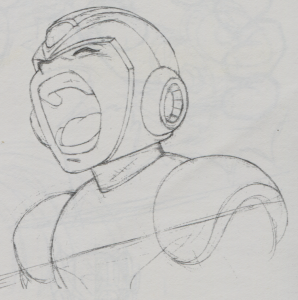 We will be looking at sketches published in the Rockman X5 Official Guide Book and R20+5 Rockman & Rockman X Official Complete Works. The screenshots are taken from Sprites, Inc. Some of these image comparisons from rough to final are pretty close while others turned out wildly different, but I find viewing both together helps to illuminate the fine details and the thought processes that went into each of these pieces. Click on the pictures to see the larger versions. Obviously, these will contain major spoilers for the game. First up is actually the scene before the final stage, where X and Zero have just fought each other to a stalemate in an epic battle. Both appear to have passed out. 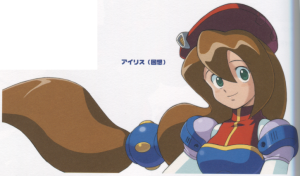 While pretty close to the final, we can make out more of the long curving shape of Zero’s hair. With the colors and textures added, the curious nature of the Zero Space area comes to life. A squared layer of holographic gridlines are horizontally projected above the characters. Sigma reveals himself and takes advantage of the situation, targeting the defenseless X with his powerful energy attacks, dubbed the Hell Spark and the Hell Blade. 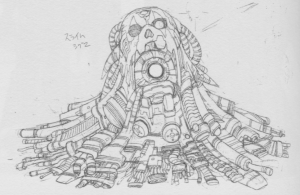 The sketch reveals a much higher degree of detail. 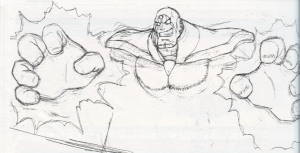 Observe the villainous glee on Sigma’s face. In the game Sigma appears far off into the background. The light and shadowplay makes him appear like a ghostly apparition. His hands, positioned closer and lower to his body, are completely obscured by the energy. I have no sketches for the next part, so we’re skipping ahead now to the aftermath of the battle with the colossal Final Sigma W. Spurned on by Zero’s refusal to accept his evil nature while desiring to torture X emotionally by mutilating his best friend, Sigma has managed to take out Zero’s left arm and the lower half of his body (unfortunately, the game does not elaborate on how this happened). 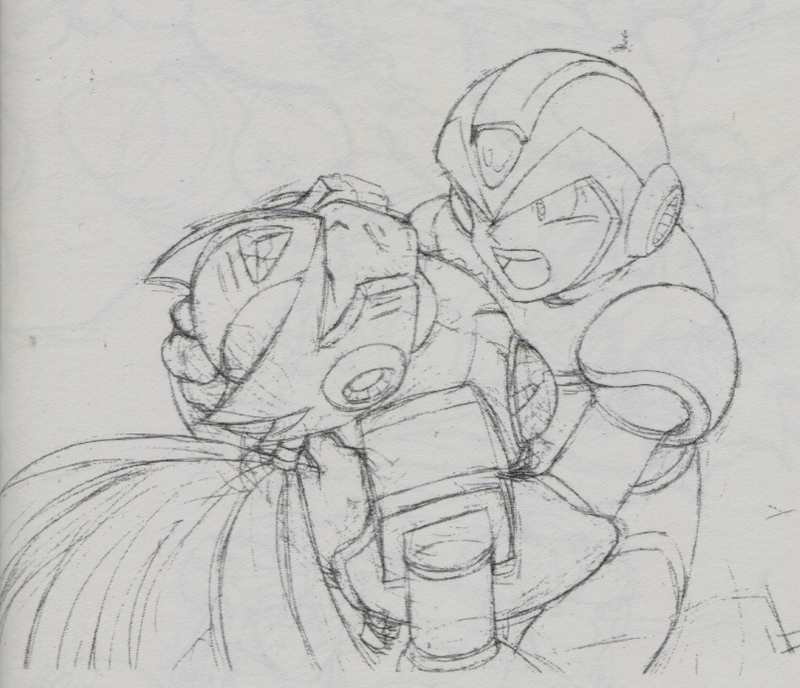 X limps over and drops to his knees, cradling Zero’s battered body in his arms. 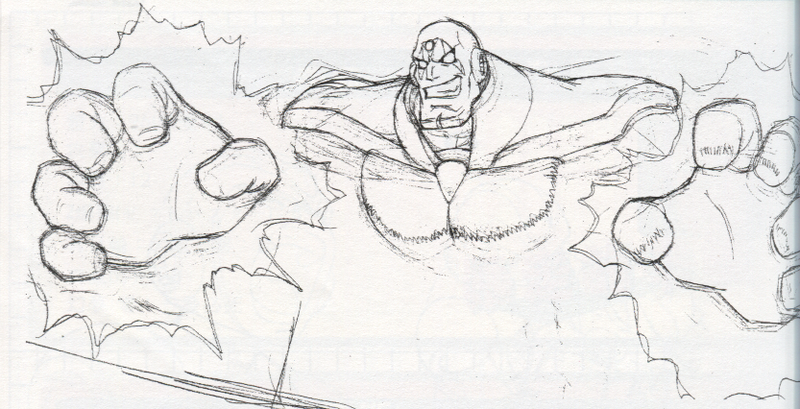 The sketch encompasses more of X and Zero. I sense more emotion coming from this image, particularly in the faces. The level of detail in Zero’s cracked gems is easier to make out, and there appears to be a hint of blood in the corner of Zero’s mouth. X looks more battle damaged himself in this version, with clear scratches on his helmet, shoulder and arm. X almost looks more angry than worried. Meanwhile, Sigma’s body has been dissolving away into a mechanical puddle of ooze and melted metals. Determined to catch X off guard, Sigma takes aim to end both X and Zero’s lives with his final breath. All the gory little details are visible in this piece. I love the dramatic tension added by the coloring and background. That one glowing red eye is reminiscent of the death of the T-800 in Terminator. Heart-stricken and grieving, X looks up just in time to see Sigma’s final attack coming, but not enough time for his body to react. Again much more of their bodies are visible. You can see Zero’s amputated left arm while his right arm hangs limp. The colors draw out more attention to the single tear streaming down X’s face. It’s hard to say where this next image fits, because I can’t recall this image appearing at all in the final game. 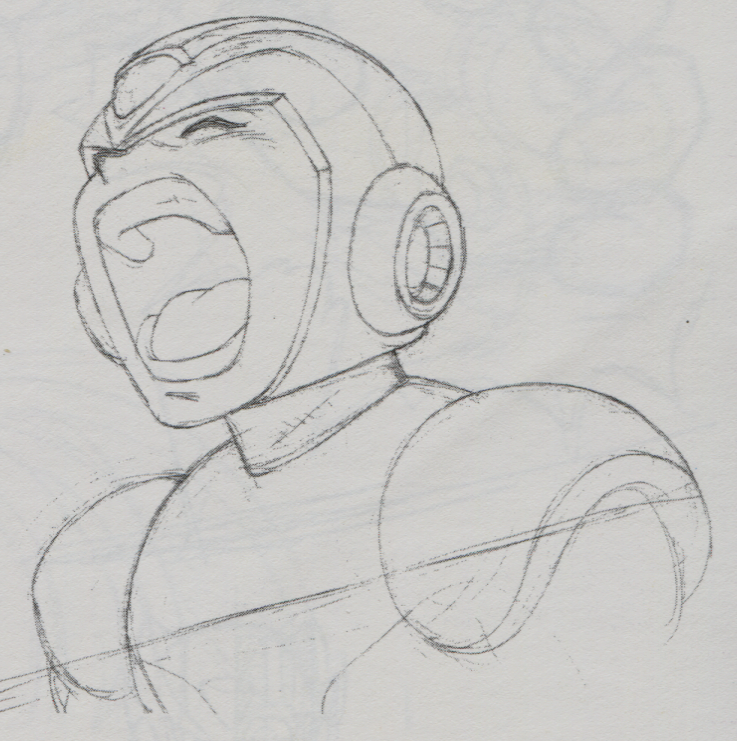 It may be a rough draft for X getting shot through the chest from Sigma’s blast, which could be what the diagonal line passing through X’s body represents. However, this is purely speculation. 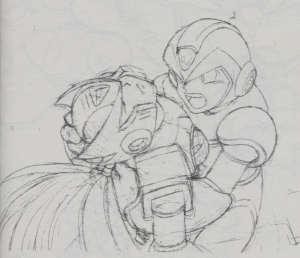 This X sketch may have gone unused from X5’s endings. Sigma’s beam passes through both our heroes. There’s a look of shock on X’s face rather than pain or suffering. The beam manages to miss Zero’s perfect flowing hair. The shot causes Zero to snap back into consciousness. He returns fire with the buster on his one remaining arm. 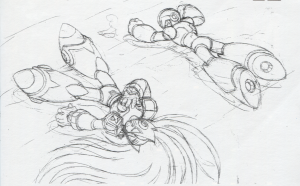 Then, satisfied that Sigma is destroyed, Zero turns his attention to wishing that X should live on. 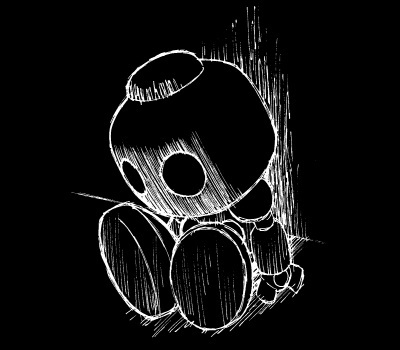 Soon his mind begins to wander as memories of his life wash over him. 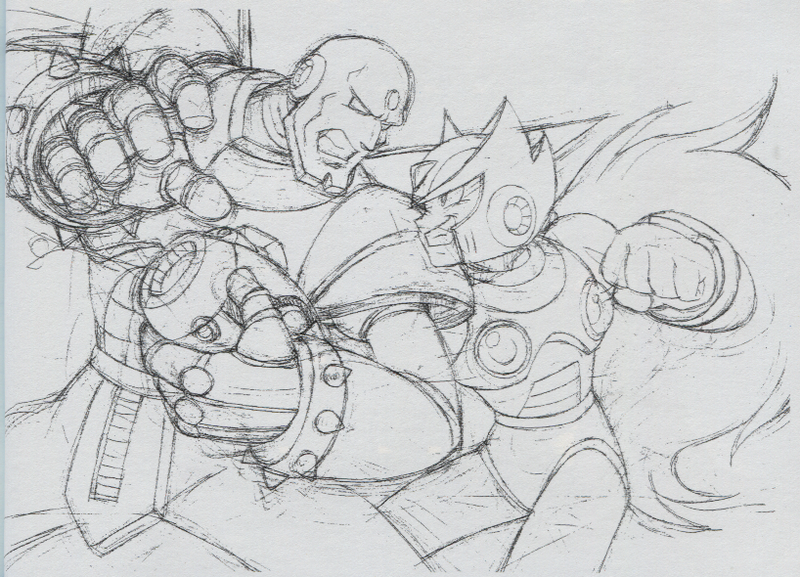 This image refers to a flashback in X4, but Zero was never shown using his buster in that scene. You can tell from his expression how much Zero is enjoying the fight. 1. His forearms should be blue, not green. 2. He shouldn’t have the spiked wrist gauntlets yet. Still an amazing scene overall. Zero’s memories wander even further back, to the mysterious shadowy scientist who haunts his dreams. 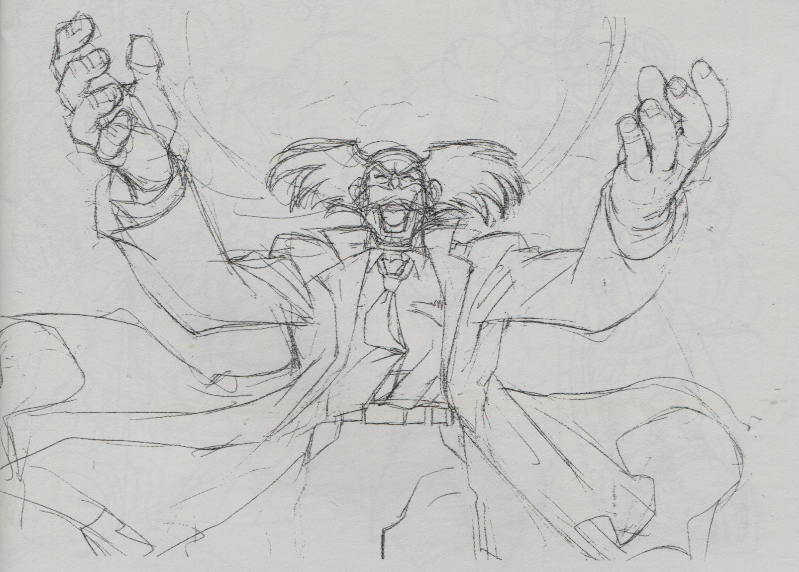 In the game this figure appeared only in silhouette, but the sketch work reveals that Dr. Wily was initially drawn out in great detail. With this draft, Zero could have remembered his father clearly for the first time. In the end they chose to leave Wily’s face in the dark. Some of the details of the coat and hands are illuminated by the image of the world projected in the background, but the rest is shadow. This is followed by a vision of Zero himself being constructed. Upon seeing this, Zero comes to an understanding of how he was created for destructive purposes, capable of spreading and being powered up by an evil virus. Comprehending this truth, Zero accepts that his own death may help bring about a permanent end to the struggle. 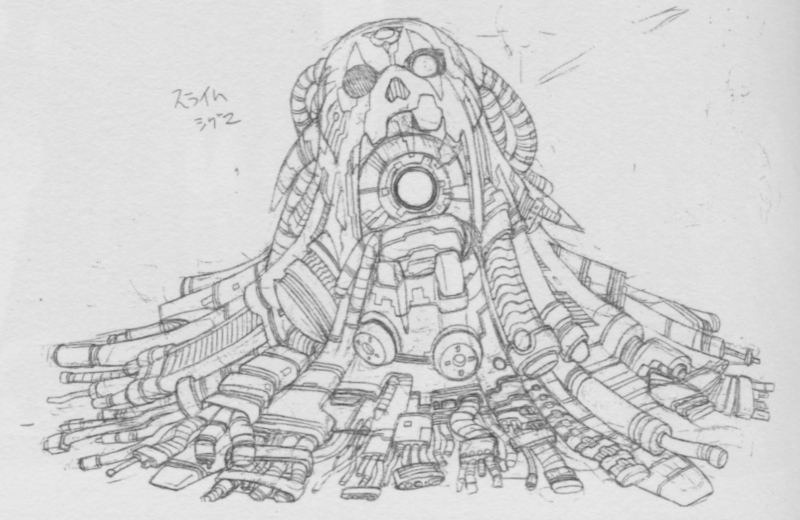 There are many details this sketch makes clear that are hard to make out in the final version. The image in the game is mirrored and rotated 90 degrees. The buster now is now shown being constructed on his left arm rather than his right. Zero has one final vision of Iris smiling peacefully before his sight fades to red. The sketchwork for this one isn’t available, but there is a beautiful full color version. Iris in all her unblurred glory (except for that shoulder that fell in the crease of the book). Is there an afterlife just for reploids? 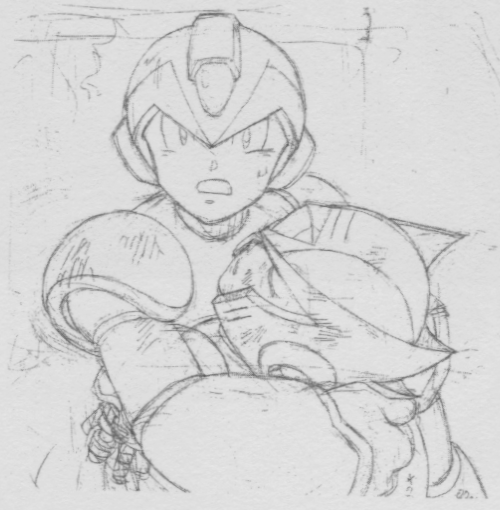 Following this experience, Zero is ready to say goodbye to X and let go of the fight, believing that Sigma and the virus will end with him. Roll end credits. I have always felt a strong appreciation for the artwork from this game and the level of style and emotion conveyed by the still images. When Zero died at the end of X5, I took it seriously. The core of his character arc as set forth in X2-X4 had been resolved: Zero unraveled the nature of his strange dreams, discovered the evil purpose he was built for, and rejected it. He defied his destiny by choosing to protect X and to bring the hope of peace to the world over following his maker’s preset path of destruction. Sigma was at last completely demolished. Zero had accepted his own imminent death and was ready to join Iris and all his old buddies in Valhalla. 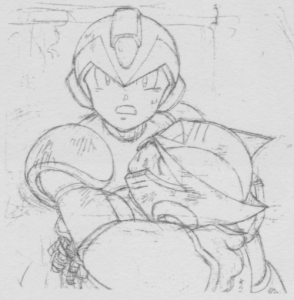 X was ready to accept his own role as a hero and carry on defending the innocent in Zero’s memory. Perhaps his dream leads him to creating the perfect world of Elysium, leading to the Legends series? I still had some lingering questions, but generally I was satisfied with the dramatic conclusion to Zero’s story. 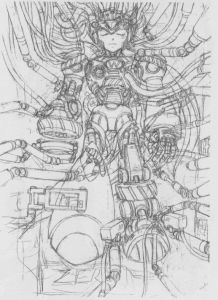 We had no idea then that Inafune was already dreaming of bringing Zero back to star in his own series, or that the folks at Capcom Production Studio 3 would soon be plotting a sequel that would retcon parts of the “good” X5 ending and bring back both Zero and Sigma. I won’t condemn their decisions, as I certainly enjoyed a great deal from the Zero series and the latter X series. Nor would I assert that the ending of X5 was completely perfect. Perhaps I just learned nothing from X2, because I will never forget how adamantly I felt back then at the end of the year 2000 that X5 was the rightful ending of Zero’s saga and that they would never bring his character back again and waste that dramatic gravitas of Zero’s deeply foreshadowed, emotionally charged, and clearly intended to be final death. Ah, the exuberance of youth. 7 Comments to "Sketch to Screen – Death of A Player"
Honestly, Capcom should’ve ended the X series with X5. If only they listened to Inafune… Don’t get me wrong, they eventually churned out the excellent X8, which fixed the series’ errors from X6 and 7, but it was unfortunately too late for X and the Hunters to live on. A proper reboot would have been nice, though. OK. About the Sigma “glowing” scene in the game, I feel that Sigma is NOT there. The sketch version show that Sigma is right there. I prefer the game version, because Sigma looks more menacing in that. Even from day one I always felt that X5 was anticlimactic. When I first played, I failed to stop Eurasia, pushed ahead anyway, saw the bad ending, loved the alleged Legends reference, tried again so I could save Zero, and sh*#!, he dies anyway. The fact that Zero dies as a matter of circumstance, seemingly half-vaporized without regard to whether it was him or X who was actually fighting, it just felt like a colossal waste (now MMZ4, that’s how you do a Zero death properly). I was glad that X6 brought him back, and I thoroughly loved both it and Command Mission. 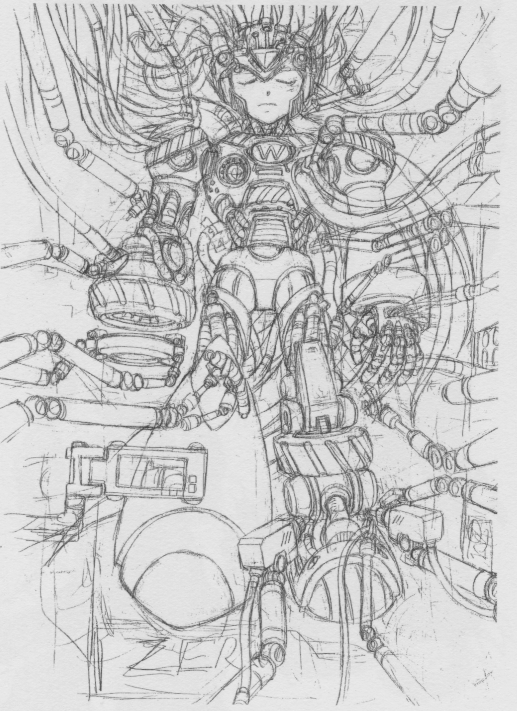 Always bugged me that we never got to see how Zero ended up so torn up. Kind of a big thing to leave out, you know? 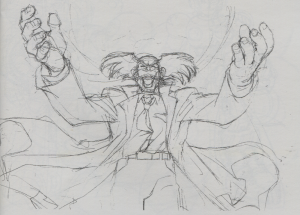 That said, one of the strongest points to me in X5 was the art — some people say the off-model X4 anime was better, but to me, this was the stuff. 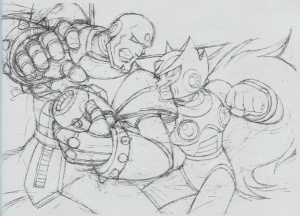 I want to see this version of the Sigma/Zero battle play out more than the one we got. Interestingly, I felt that this is also where X6 excels over X5, since art of the same quality was displayed at a greater size. Oh you … Sigma… I love how persistent he is, I love his form when he shot X and Zero. And X5 ending is still my favorite game/anime/everything ending so far. And I love X’s innocence and dream.